Big boy rooms are adventurous…they are exciting. For the little boy who leaves behind his nursery…and the mother who is expecting a new addition to that room he is leaving behind. I had so much fun working on this particular room! We wanted to create a look that can grow as the little boy does. Not too baby…but not too grown up either. I was inspired by the beautiful John Robshaw fabric we used on the bed pillow. From there, we added layers of fabrics and textures with tones of blues and pops of chocolate. When Jack grows out of the crib, we will add another twin bed to that side of the room. 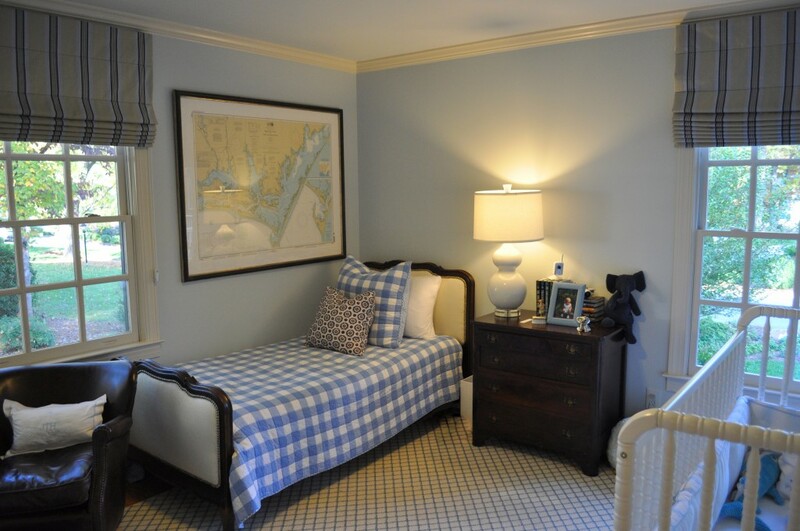 I have always loved maps, and I think the one over the bed is appropriate for a little boy who loves to roam and explore.